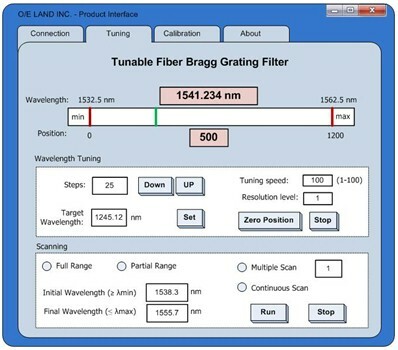 The new Electrical Tunable Fiber Bragg Grating with model number OETFG-200E from O/E Land Inc. offers the flexibility of the electronically controlled tuning of the FBG wavelength in a compact, turn-key solution product. It can provide stable tunable range, simple structure, high resolution, and long life time. The tunable filtre uses fibre Bragg grating technology and, when available, an optical fibre circulator to provide a bandpass signal to the output port. Circulators are readilty available at the 1060 nm, 1310 nm and 1550 nm ranges. For other wavelength ranges, please inquire about customized solutions. FBG specifications can be customized (some limitations apply). The customer can use computer-controlled operation in a user-friendly interface through the USB port to tune the wavelength. 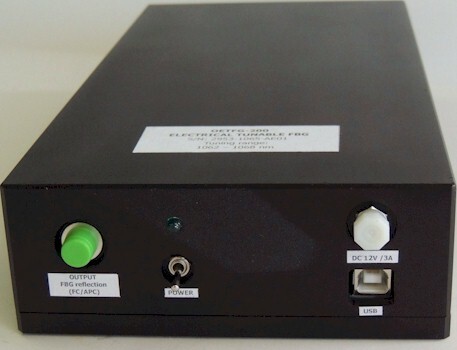 The Electrical Tunable FBG can be used as dynamic add/drop, wavelength router/switch, dynamic dispersion compensation fibre grating, dynamic gain flattening, tunable fiber laser, fiber sensor system, and also in any other custom applications, where tuning of the FBG wavelength is required. Tuning range can vary depending on FBG specifications, especially the length. Some limitations apply. FBG parmeters can be customized. Some conditions apply, depending on the tuning range required. Maximum resolution is achieved when lowest speed is used. Maximum speed is achieved when lowest resolution is used. The software controlled version of the new Tunable Electrical FBG comes with drivers and GUI for operating the unit. It provides flexibility for controlling the most important parameters such as tuning wavelength, speed, resolution, as well as many scanning options � full or partial range, multiple or continuous scan. The device could also be completely calibrated by the user in the case of off calibration.